Booking dozens of vendors, coping with an ever-growing guest list, and arguing over linen colors and centerpieces just never sounded fun to us. Too often managing societal expectations and peer pressure results in someone saying, “Why don’t we just elope?” So, why don’t you? If you’d rather start your marriage with a unique, unforgettable adventure instead of planning a traditional ceremony and big, extravagant party, you’re not alone. We feel the same way. 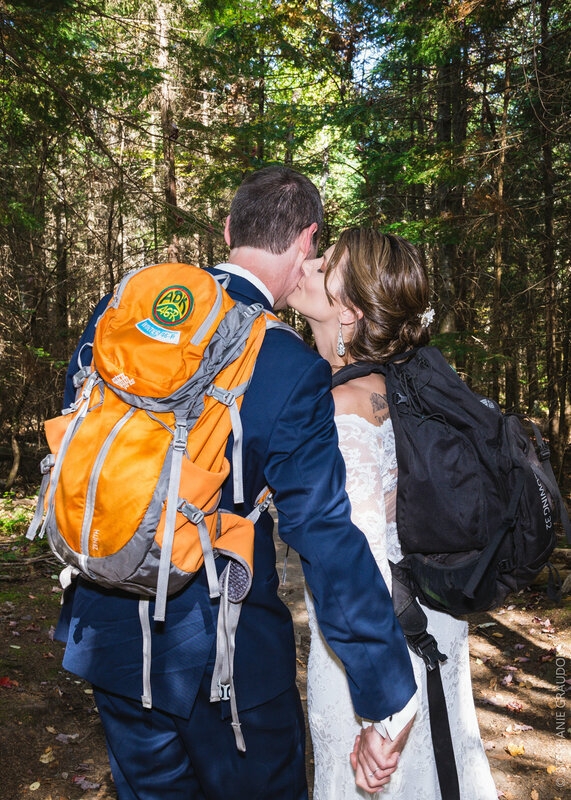 We favor big adventures over big weddings any day, and we want to help you celebrate: your love, your way. We’re guessing you’re here because you love the outdoors and enjoy spending your free time hiking, camping, rock climbing, or paddling. Think about some of your favorite views, and imagine yourself in your desired wedding attire, exchanging vows before that vista. Perhaps you’re beside a peaceful lake, on a forest trail surrounded by vibrant fall foliage, or taking in the view from a scenic overlook or fire tower. The beautiful landscapes in the northeast United States do not require any decorations, and the ever-changing weather and light create endless opportunities for emotional moments and breath-taking photography. If you want us to wake up at midnight and hike to a summit for your mountaintop ceremony at sunrise, we'll totally do it. We're all about helping (and enabling) you to create whatever crazy adventure suits you, and we’ll capture the genuine smiles, the happy tears, and the authentic moments that fill your big day. We know it takes a lot of work to do your research, find the best locations, and plan the perfect day – and you’re in luck, because our passion is planning and customizing all sorts of adventures, big and small, close to home or miles into the backcountry! 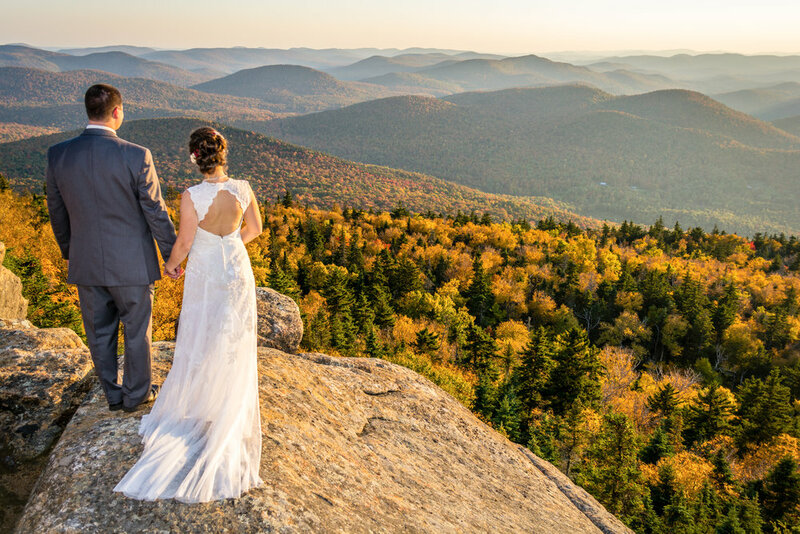 With extensive knowledge of trails and viewpoints in the Adirondacks of New York, Green Mountains of Vermont, and White Mountains of New Hampshire, we'll offer site suggestions and provide special considerations for desired locations to help you plan at no extra charge. We also LOVE exploring new places all over the northeast, so send us your ideas and if we haven’t been there, we'll scout it out for you! For adventures requiring 5+ hours for the hike, ceremony, and shooting time. In addition to the bride, groom, officiant, and photographer(s), we allow up to 10 additional guests. Group sizes for hiking adventures are kept small to minimize our impact on the landscape and other potential hikers/visitors. Includes high-resolution digital files, a personal use print release, and all the planning assistance you need! For more accessible destinations that don't require hours of hiking to reach, this includes up to 4 hours of photography coverage, high-resolution digital files, planning assistance, and a print release that allows you to print at your leisure. Additional guests are welcomed, but may be limited to respect land regulations where applicable.